Follow our blog to get the latest news on our products, events, and saké! Founded by a man named Seijiro Nakano in 1892, the Dewazakura Brewing Company is based in the northern region of Japan. Though the sake brewery has not been established for a long time, they are internationally known and highly respected in the sake industry. Nestled at the bottom of a river valley and surrounded by two mountain ranges, Dewazakura is located in Tendo City in Yamagata Prefecture where the summers are warm, and the winters filled with snow. Yamagata, which means “place of mountain,” is known to be one of the best areas to produce rice, fruit, and of course, delicious sake. “Dewa” is actually the old name of Yamagata, while “Zakura” (or sakura) is cherry blossom which is the signature flower. Besides its beautiful landscape, Dewazakura Brewing Company boasts its reputation on its traditional yet skillful way of brewing as well as its innovation. Until 40 years ago, people were still drinking the sweet and lower quality sakes. In 1981, Dewazakura Brewing Company released the “Oka” aka “Cherry Blossom,” a Ginjo grade sake polished at 50 percent at an affordable price. It was light with an incredible bouquet of aromas and was to be drunk cold and was simply delectable. It was this sake that created the “Ginjo Boom” and soon other breweries would create their own Ginjo and Daiginjo grade sakes making Dewazakura pioneers in sake history. 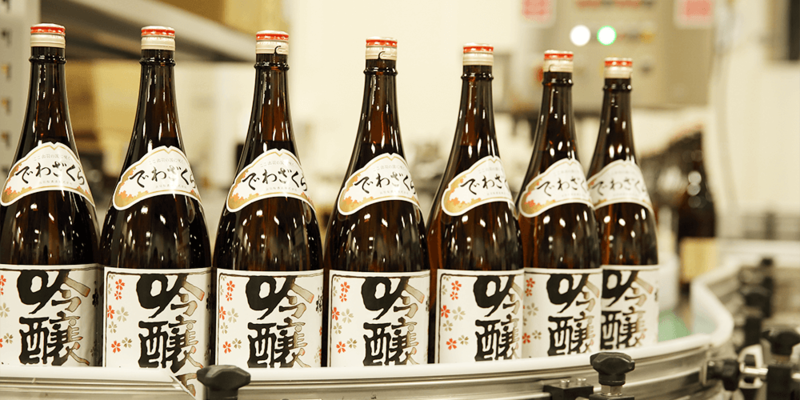 By 1991, the brewery had mastered their cold storage techniques and aged fresh sake at 28 degrees Fahrenheit to preserve its aroma and flavors until bottling. Dewazakura Brewing Company has since created multiple award-winning sakes and still continues to make high quality sake that is now exported to over 30 countries all over the world and is still run by the Nakano family. Metropolitan is proud to carry a variety of Dewazakura’s sakes. Find them on our Ontario and Québec portfolios here. For more information on the brewery, check out their website.